I know, right? An unusual combination, but a delicious one. 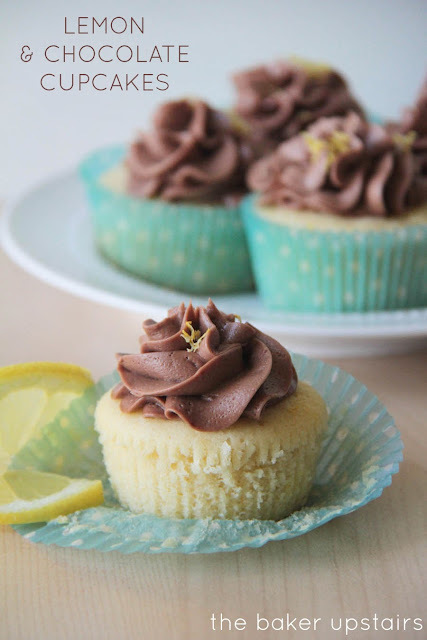 I had never considered making a lemon cake with a chocolate buttercream until I started reading The Particular Sadness of Lemon Cake last week. The jury's still out on whether it's a great book or not (I'm only about a third of the way through it) but it did get me thinking about cake. And how I love cake, and cupcakes in particular. 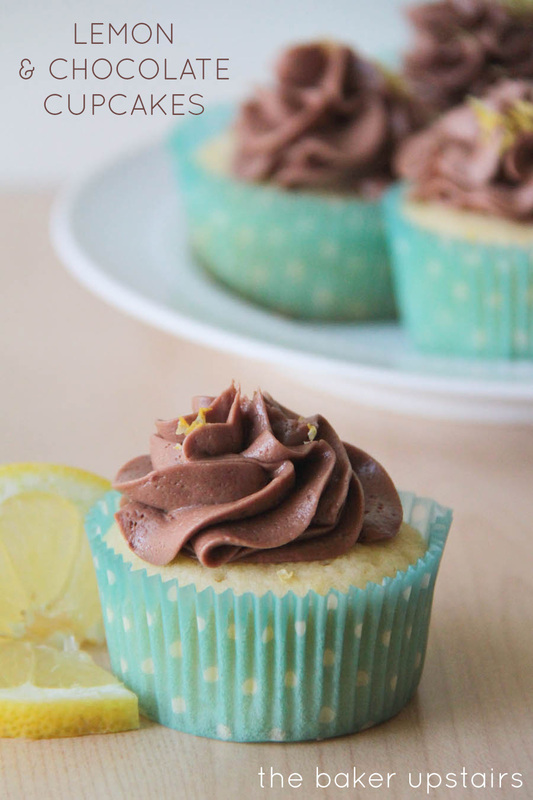 These particular cupcakes are super moist and light, but still hold together really well without crumbling. They have just the right amount of tartness, contrasting with a buttery sweetness. And the combination with the rich and luscious chocolate buttercream is just awesome. And seriously, look how moist and perfect this cake is! These cupcakes are a new favorite and so unique! Enjoy! Preheat oven to 350. Line 12-16 muffin cups with paper liners (depending on scoop size). Whisk together flour, baking powder, baking soda, and salt in a small bowl, and set aside. In a large bowl or the bowl of a stand mixer, cream together sugar, butter, and lemon zest. Mix in oil, egg, egg yolks, lemon extract, and vanilla, and blend until smooth. In a small bowl or measuring cup, mix togher milk and lemon juice. Add flour mixture in three batches, alternating with the milk and lemon mixture. Mix until smooth. Scoop into prepared muffin cups, filling 1/2 - 2/3 full. Bake 17 - 20 minutes, or until a toothpick inserted into the center of a cupcake comes out clean. Remove from oven and cool completely. In a large bowl or the bowl of stand mixer, cream the butter until light and fluffy. Beat in vanilla and milk, then add cocoa and powdered sugar. Whip until the mixture lightens and is smooth and creamy. 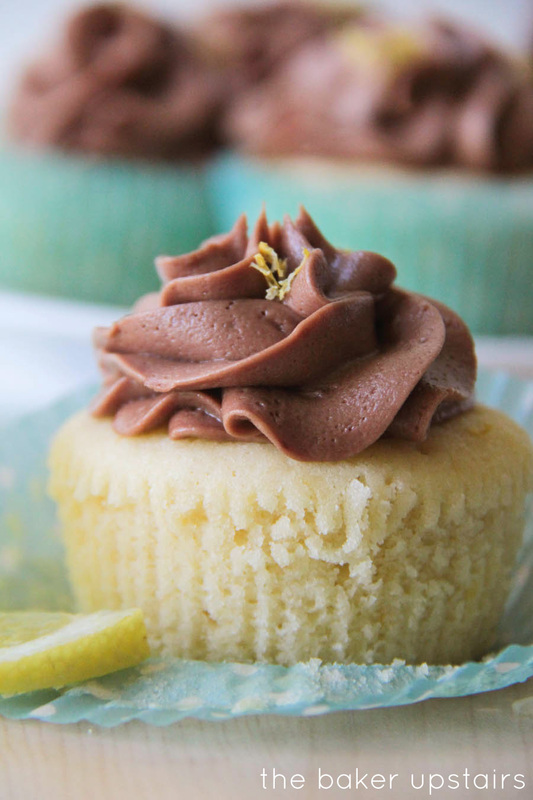 Frost cooled cupcakes and sprinkle with lemon zest (if desired). I have got to try this combo!! !